Objective: Adolescents with type 1 diabetes (T1DM) must consider multiple factors in diet planning, including glycemic control and cardiovascular disease prevention, while ensuring adequate nutrition for growth. We examined diet composition, quality, and compliance for two dietary patterns - the traditional Dietary Approaches to Stop Hypertension (DASH) and a modified version of DASH in this population. Methods and Findings: Two feeding studies were conducted. First, adolescents with T1DM consumed their usual diet for 6 days followed by traditional DASH for 6 days. Next, DASH menus were adjusted to align with T1DM nutrition guidelines, and this modified DASH for Diabetes (DASH-D) was tested on a new group of adolescents with T1DM for 6 days, following 6 days of usual diet. Usual diet was measured via 24-hr dietary recalls. Dietary composition of DASH-D was compared to DASH and usual diet. Eighteen adolescents (9/group) participated. Compared to usual diet, intake of protein, fiber, fruit, vegetables, lean meats, and low-fat dairy were higher, while saturated fat and added sugar were lower, in DASH-D. Percent energy from fat was higher, and from carbohydrate lower, in DASH-D versus traditional DASH, with food group intake reflecting these patterns. Participants consumed 87% of foods provided for DASH, and 98% of foods provided for DASH-D. In both DASH iterations, participants met national guidelines for fat, saturated fat, fiber, and fruit/vegetable intake, while usual diet fell short of these recommendations. Conclusions: The novel DASH-D pattern meets guidelines and may be a viable option for achieving nutrition goals for adolescents with T1DM. Type 1 diabetes mellitus (T1DM) is an autoimmune disease affecting approximately 1 in every 500 youth under the age of 18 in the United States . Individuals with T1DM are dependent on exogenous insulin, and must coordinate insulin dosing with dietary intake and physical activity in order to maintain stable blood glucose levels. Dietary intake including food type, combination, and distribution can play a key role in either inducing or preventing postprandial glucose surges. However, at present, no specific dietary structure or pattern has been defined as ideal for T1DM. Evidencebased dietary recommendations from the American Diabetes Association (ADA) for youth with T1DM incorporate specific guidelines for glycemic control, and management of lipids, blood pressure and weight to support healthful growth and development and prevent chronic complications. As such, the ADA recommendations for nutrition therapy for diabetes emphasizes predominantly plantbased forms of carbohydrate (CHO) from fruits, vegetables, whole grains, and legumes along with low fat milk to minimize saturated fat (SFA) and added sugar . The abundance of dietary fiber from many of these foods may help slow carbohydrate absorption and control post-prandial glucose surges . However, data from the SEARCH for Diabetes in Youth study showed that dietary intake of youth with T1DM was suboptimal compared to ADA nutrition recommendations. Specifically, fewer than 20% of youth consumed 5 or more fruits and vegetables per day, diets were devoid of whole grains, and intake of saturated fat was well above recommended levels . The ADA also recommends monitoring CHO intake throughout the day to maintain optimal glycemic control . These ADA nutrition guidelines are well-aligned with those of the Dietary Approaches to Stop Hypertension (DASH) dietary pattern. One of the ADA’s nutrition therapy goals for adults with diabetes is to support patients in healthy meal planning rather than focusing on individual macronutrients . The DASH diet is an eating plan rich in fruits, vegetables, whole grains, and low fat dairy products, and low in saturated fat and added sugars . Among adolescents with T1DM in the SEARCH study, those whose diets were closer to a DASH dietary pattern had lower odds of hypertension than those whose diets were less similar to DASH . The DASH diet contains CHO sources rich in fiber and low in added sugar, both of which help to slow the conversion of CHO to blood glucose. It has been shown that adolescents with optimal glucose control (Hemoglobin A1C ≤ 7.5%) had lower intakes of added sugar, higher intakes of fiber and fruits and vegetables, and a more consistent daily meal pattern (e.g., having breakfast/ supper regularly) than those whose glucose control was suboptimal . Thus, following a DASH dietary pattern may be beneficial as an approach to managing blood glucose in adolescents with T1DM, and preventing longer term complications associated with diabetes. Our research group recently reported results from a study in which adolescents with T1DM followed a DASH diet as compared to their usual diet. While patients demonstrated good compliance with the DASH diet, it was observed that following DASH increased glycemic variability compared to usual intake, and showed a trend toward hypoglycemia . These results warranted modification to the traditional DASH eating plan to optimize glycemic control in the T1DM population. The outcome was a modified DASH for Diabetes (DASH-D), which resulted in glycemic variability similar to that experienced with usual intake, but lower average blood glucose and less time spent in hyperglycemia. The purpose of this report is to describe the development of the DASH-D diet wherein key elements of ADA-recommended nutrition therapy were incorporated into the traditional DASH eating plan with the goal of improving glycemic control. We also present a comparison of DASH-D to both traditional DASH and to usual intake of adolescents with T1DM on nutrient and food group patterns. The authors conducted two short-term controlled feeding studies of DASH-type diets in adolescents with T1DM. The first iteration used a traditional DASH diet, and the second involved modifying the DASH diet to more closely align with ADA recommendations (DASH-D). The two feeding studies were performed consecutively, with each having a unique group of participants (in other words, we did not have just one group follow both DASH-type diets). Male and female adolescents, age 11-17y, with antibody positive T1DM and duration of disease > one year, who were on exogenous daily insulin of at least 0.5 units/kg for body weight, were included. In addition, potentially eligible individuals had to have a body mass index (BMI) < 95th percentile for their age and a screening A1C level between 7-11% (53-97 mmol/mol). Those who had food allergies, intolerances or other dietary restrictions, and/or other health conditions or medications known to influence blood glucose levels were excluded. Letters were sent to potentially eligible individuals from the Diabetes Center at Cincinnati Children’s Hospital Medical Center (CCHMC), and those interested were screened by phone and invited to the hospital’s Clinical Translational Research Center (CTRC) to hear more about the study. Eligible individuals who agreed to participate completed the informed consent process, during which study procedures, benefits, and risks were explained. Written assent and parental consent were obtained prior to any study procedures. The study was reviewed and approved by the Institutional Review Board (IRB) of CCHMC, IRB number 2011-0338. After screening and enrollment, participants returned to the CTRC for a total of five visits. (FIGURE 1). At the first visit, medical history, height, weight, heart rate, blood pressure, and a finger stick blood sample to measure A1C were collected. A 24-hour dietary recall interview was also conducted at this visit. This and subsequent dietary recall interviews were administered by trained CTRC nutrition research staff using the USDA’s Automated Multiple Pass Method (9) to ensure accurate collection of food items and amounts consumed. After one week, participants returned for another visit, where the 3-day “Usual Diet” phase began. During this phase, participants ate their usual diet and completed three more 24-hour dietary recall interviews via telephone to report their intake on each day. Food group and nutrient intake data from all four dietary recalls were analyzed using Nutrition Data System for Research (NDSR, Nutrition Coordinating Center, Minneapolis, MN), and averaged together for an estimate of usual intake. At the end of the Usual Diet phase, participants returned to the CTRC and were given 3 full days of take-home meals and snacks adhering to the DASH dietary pattern  with energy tailored to the individual to ensure weight maintenance. After the first 3 days, participants returned to the clinic to pick up another 3 days of DASH meals and snacks. The majority of meals and recipes, along with food group serving counts, were based on the DASH4 Teens guidelines . This diet provides approximately 8 servings of fruits and vegetables and 3 servings of low-fat dairy foods per day, with the rest of the diet made up of a balance of whole grains, low-fat meats and other protein sources, and a minimum of DASH-unfriendly foods (fats, sweets, and salty snacks). Menus comprised Breakfast, Lunch, Dinner, and up to 2 snacks, depending on energy needs. For each meal and snack, several options were offered, and participants were allowed to choose which ones they wanted for their study meals (FIGURE 2). All meals were designed by a registered dietitian and prepared in a research kitchen. To monitor compliance and assess actual intake, a checksheet was provided for each DASH diet day that included a detailed list of foods including carbohydrate amounts so that participants could program insulin doses accordingly. Check-sheets captured meal and snack times, and prompted the participant to record whether each food was eaten, uneaten, or partially eaten. Check-sheets for most participants also listed the total and available carbohydrate (total carbohydrate minus dietary fiber) per meal so that the participant could dose his/her insulin accordingly. Uneaten study foods were weighed and subtracted from the initial amount provided. While participants were encouraged to consume only those foods provided during the DASH diet phase, use of outside foods was permitted when needed to correct a low blood glucose reading. Participants were instructed to record any outside foods or drinks consumed on their check-sheets. To determine actual intake during the DASH diet phase, outside foods were added to and returned study foods were subtracted from what was originally provided. Figure 1: Search strategy used for the inclusion of the studies considered in the current metaanalysis. Figure 2: Search strategy used for the inclusion of the studies considered in the current metaanalysis. Approximately a year after completing the DASH feeding study and examining results, we set out to create and test the modified “DASH-D” plan. Modifications were designed to enhance acceptability and prevent episodes of hypoglycemia by aligning it with ADA’s recommended diet principles for adolescents with T1DM(2). The DASH-D plan incorporated the high fruit and vegetable/low-fat dairy/lean meat guidelines from DASH along with the following modifications for T1DM: • Each full day had a target macronutrient distribution of energy as 50% carbohydrate, 30% fat, and 20% protein, with the goal of maintaining this distribution across each meal/snack. This was different from traditional DASH, where the daily food group serving guidelines were applied with no special attention to macronutrient composition for the full day, or distribution within meals. Having consistent macronutrient composition at each meal may allow for easier insulin dosing and help stabilize glycemia. •Fiber was distributed across meals and snacks throughout the day, with the goal of balancing and increasing fiber intake. While the DASH diet provides adequate fiber, it is not necessarily balanced across all meals. Fiber content in a meal helps control post-prandial glucose. •Total daily fat goal was higher than in the traditional DASH diet and focused on increasing monounsaturated and polyunsaturated fats (MUFA and PUFA), while keeping saturated fats low. Higher unsaturated fat intake may lower fasting glucose in diabetes [12-14], while a high intake of saturated fat is associated with poor glycemic control . •Rather than provide options for complete meals (as was done in DASH), the study dietitian offered 2-3 selections for each meal’s “main dish” and then a variety of options for side dishes (fruits, vegetables, and grains) (FIGURE 3). This change was implemented in DASH-D to improve the acceptability of the diet and increase adherence. We recruited a second group of adolescents for the DASH-D feeding study. 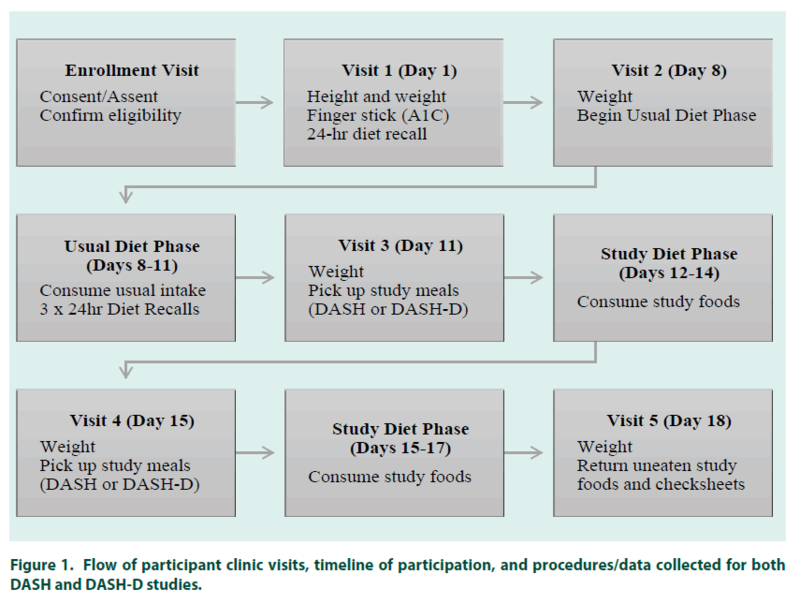 Participants underwent the same enrollment and baseline procedures, and the Usual Diet phase, as outlined in Figure 1. Briefly, following the Usual Diet phase, subjects began the DASH-D phase and were given 6 days of meals (3 days at a time) adhering to this modified DASH diet. Check-sheets for the DASH-D phase included total as well as available carbohydrate per meal, so that participants could set the insulin dose by the available carbohydrate, lowering the risk of hypoglycemia. Information on uneaten study foods and outside foods consumed was collected and used to determine actual intake. Figure 3: Search strategy used for the inclusion of the studies considered in the current metaanalysis. Statistical Analysis Software (SAS) version 9.4 (SAS Institute Inc., Cary, NC) was used for all data analyses. Means and standard deviations were calculated for baseline age, A1C, and BMI, as well as nutrients and food groups consumed as part of usual intake and in the two study diets (DASH and DASH-D). To indicate acceptability of the study diets by participants, percent of study food eaten (of total gram weight) was used as a proxy. Uneaten food portions were weighed and subtracted from the original amount provided. A one-sample paired t-test was used to compare nutrients by day and by meal, and food group servings by day, between participants’ usual intake and DASH-D intake. A two-sample t-test was used to compare nutrient and food group composition of the DASH-D study diet to the traditional DASH diet provided in the earlier phase. These 2 feeding studies were performed about 1 year apart in different participant groups, so comparison of the diet within individuals via paired t-tests was not possible. When variances were equal, the p-value generated by the Pooled method was used, and when variances were unequal, the p-value from the Satterthwaite method was used. Results of analyses were considered significant if the p-value was less than 0.05. Ten participants (5 females) were enrolled in the initial DASH feeding study. One participant was not included in the diet analysis because he/she failed to consume the study food as instructed, missing at least one entire day of the 6-day feeding study. Therefore, nine participants (5 female) were included in the final analysis for DASH. The following year, 11 (7 female) participants were enrolled in the study of the DASH-D plan. One participant was unable to complete the study due to acute illness during participation, and another was withdrawn due to non-compliance in the DASH-D feeding phase of the study. Nine participants (6 female) completed the DASH-D study and were included in the analysis. There were no differences between the two study samples in age (p = 0.54) or baseline A1C (p = 0.65). However, weight, BMI, and BMI percentile were higher (p<0.05) in the DASH-D group (TABLE 1). Table 1. Baseline Characteristics by Study Group. Total energy and grams of protein, carbohydrate, and fiber were similar between the two DASHtype diets; total fat was significantly higher in the DASH-D versus traditional DASH (73.3 vs 46.9 grams, p=0.0055). With regard to macronutrient distribution there was a tradeoff between the standard and modified versions of DASH, with percent of energy from protein holding steady between the two diets, while percent of energy from fat was higher in the DASH-D diet (30.0 vs 22.3 percent, p<0.0001) and percent of energy from carbohydrate was higher in the traditional DASH diet (59.4 vs 49.0 percent, p<0.0001). Food group serving intakes reflected these nutrient patterns. There were no differences between the two diets in fruit, vegetable, and grain servings, but fat servings were higher in the DASH-D diet (3.1 vs 2.1 servings, p=0.0179) while sweets were higher in the traditional DASH diet (1.0 vs 0.5 servings, p=0.0463). There were also significant differences in food group servings of protein-source foods. Lean meat servings were significantly higher in the DASH diet than in DASH-D (5.5 vs 4.2 servings, p=0.0243) while other protein (non-meat sources such as eggs, nuts, and beans) and low-fat dairy servings were higher in DASH-D versus DASH [4.0 vs 2.0 servings (p=0.0082), and 3.2 vs 2.6 servings, (p=0.0045), respectively]. Two sample t-tests were used for all comparisons between traditional DASH and DASH-D diet components. At the daily intake level, there were no differences between the DASH-D phase and participants’ usual intake in total energy, fat, carbohydrate, and percent of energy from carbohydrate. However, intake of total protein, fiber, saturated fat and added sugar, as well as percent of energy from protein and saturated fat, were significantly different, with higher protein and fiber in the DASH-D diet and higher saturated fat and added sugar in participants’ usual intake. As would be expected for a DASH eating pattern, intake of certain food groups also differed between the two diets. Servings of fruit, vegetables, lean meats, other proteins, and low-fat dairy were significantly higher in the DASH-D phase as compared to usual intake. However, there were no differences between the two diet patterns in servings of grains, fats, or sweets (TABLE 2). Nutrient intake at individual meals differed depending on the meal (TABLE 3). Across most meals, total and saturated fat (both in absolute terms and percent of energy) and added sugar were lower, while protein (absolute and percent of energy) and fiber were higher, in the DASH-D phase compared to usual intake. Total carbohydrates did not differ at any meal, yet for breakfast and dinner, the percent of energy from carbohydrates was significantly lower for the DASH-D diet compared to usual intake. Importantly, the pattern of carbohydrate, fat, protein, and fiber balanced throughout meals and snacks was more consistent in the DASH-D diet versus usual intake (FIGURE 4). aServings for lean meats and other protein are expressed in ounce-equivalents, where 1 serving is equal to 1 ounce of meat, 1 tablespoon nut butter, 1 egg, or ½ ounce of nuts. bOther protein” includes nuts, seeds, eggs, and meat substitutes. Table 2. Nutrients and Food Group Servings, daily intake mean (SD), DASH-D versus Usual Intake. One-sample paired t-tests were used for comparisons. Table 3. Nutrients by Meal, mean (SD), DASH-D versus Usual Intake. One-sample t-tests were used for comparisons. Figure 4: Search strategy used for the inclusion of the studies considered in the current metaanalysis. Adolescents who participated in the traditional DASH feeding study consumed 87% of foods provided, whereas those in the DASH-D study consumed a higher proportion (98%) of the foods provided. The average macronutrient composition and food group servings per meal actually consumed on DASH-D reflected the planned DASH-D goals, further indicating that participants were compliant with the diet. Some comments from participants and their parents about the traditional DASH diet include: “liked the diet”; “I could eat like that”; foods offered were “. . . far better than I expected”; and “Successful recipes. Daughter tried new foods!” Kids also commented that they were hungry at times on this diet, but they liked having snacks between meals which helped their hunger. Comments from parents and participants in both studies indicated that they enjoyed the DASH-D meal plans overall, and some requested DASH-D recipes. – designed to better meet the unique dietary needs of this population. Previously published results from our research team showed that these modifications were associated with some improvement in glycemic variability versus traditional DASH, while helping participants maintain a lower mean blood glucose and less risk of hyperglycemia as compared to their usual diet . 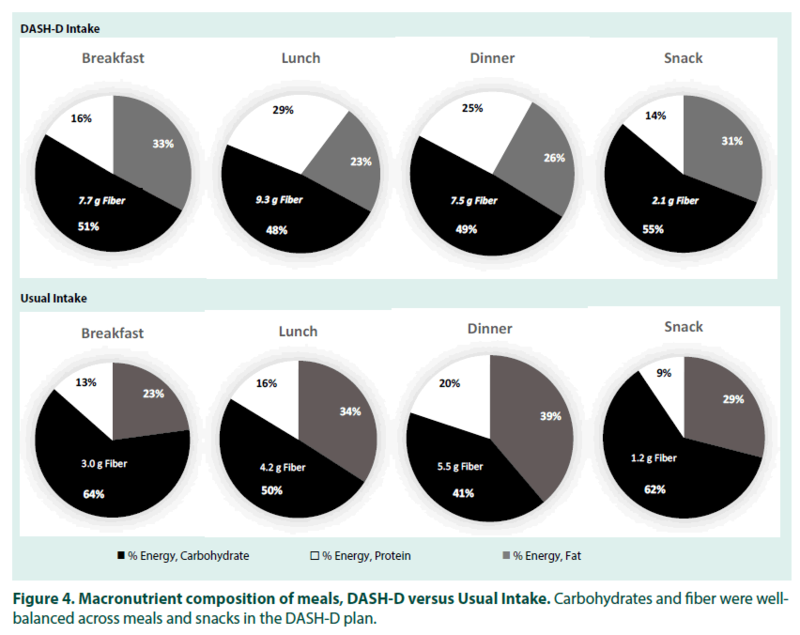 Modifications employed to create DASH-D included increasing total fat, while balancing macronutrient and fiber distribution throughout all meals and snacks. Dietary fiber is beneficial in diabetes because it helps control post-prandial blood glucose, likely by slowing the rate of gastric emptying. Other health benefits of dietary fiber include weight management, prevention of cardiovascular disease, and digestive health . Despite recommendations from the latest Dietary Guidelines for Americans to consume 22 to 31 grams of fiber daily , children and adolescents in the US consume just 13.2 grams of fiber per day on average . Assessment of their usual diet indicated that our participants consumed about 15 g fiber daily. However, in our feeding studies, they consumed 27.9 (DASH) and 31.5 (DASH-D) grams of fiber per day, indicating that they were meeting recommended amounts while following the eating pattern. The traditional DASH diet tends to be relatively low in fat . In our study, participants consumed 22.3% of energy from fat while on the traditional DASH diet, falling below the national recommendation of 25-35% . Low-fat diets had long been recommended for heart health, but more recently it has been recognized that the type of fat consumed may be more important than the amount, spurring the ADA, AHA and others to recommend a moderate total fat intake while reducing saturated fat to less than 10% of energy and replacing it with MUFA and PUFA [2,17,19]. Recent studies show a benefit of dietary fat for diabetes as well, with consistent findings that a higher fat diet emphasizing unsaturated fats results in decreased fasting plasma glucose over time in those with type 2 diabetes [12-14]. The effects of higher fat on postprandial glucose, however, are less clear. A low fat intake has been shown to extend postprandial glucose excursion, whereas higher fat may attenuate the glycemic response by slowing the rate of gastric emptying following a meal [20-22]. A 2015 systematic review reported that higher fat-containing meals can suppress glucose levels in the early postprandial period (2-3 hours), but may increase it again in the later period (~5 hours post-meal) . Our DASH-D diet provided an average of 30% of energy from fat per day, lowering saturated fat to just 8.2% of energy (compared to 13.3% in the participants’ usual diet), while the remainder of fat intake consisted of MUFA and PUFA, mostly from nuts and oils. While a traditional DASH eating pattern focuses on achieving a daily intake goal of certain food groups (fruit, vegetables, grains, etc. ), ensuring an even distribution of macronutrients and fiber from meal to meal is important for glycemic control in T1DM. 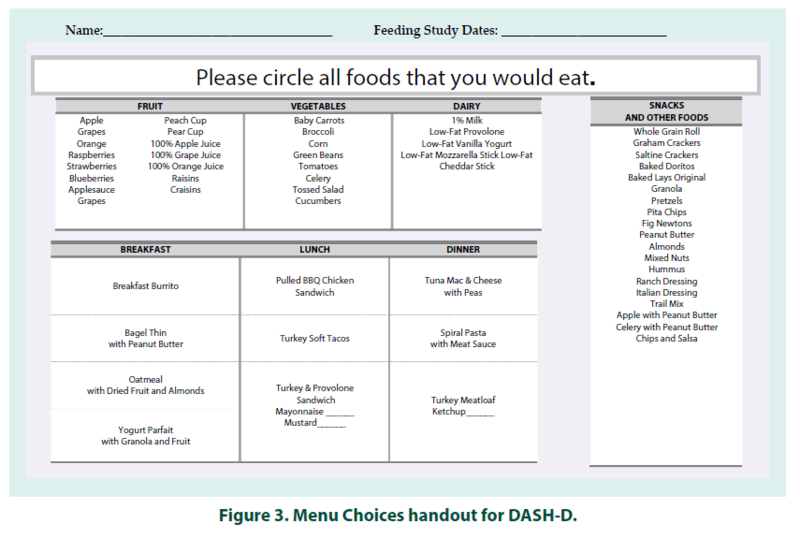 The DASH-D plan aimed to achieve the daily DASH goals while distributing carbohydrate, protein, fat, and fiber across the day in meals and snacks. Figure 2 demonstrates that although it was not feasible to make each meal identical in composition, the meals and snacks were more balanced in macronutrients as compared to participants’ usual intake. As with any diet recommendation, a person’s ability to comply is a key consideration. Our results indicate that adolescents with T1DM are able to comply with DASH in both its traditional and modified versions. A review of DASH intervention studies found overall poor compliance with the diet (24), but few studies have monitored dietary compliance with DASH in adolescents [11,25]. Saneei et al. studied metabolic syndrome factors and monitored dietary compliance in a group of adolescents following either a usual diet or a selfselected DASH diet for six weeks, in a crossover design. The adolescents had good compliance while following the DASH diet, as measured by consumption of DASH-appropriate nutrients and food groups as well as changes in serum vitamin C levels between the two diets . Another study conducting a 3-month DASH diet intervention for hypertensive adolescents found that participants were compliant with some aspects of the DASH diet (fruit and vegetable intake) but not with other aspects (participants still maintained higher intake of fat and sweets despite recommendations to minimize these) . 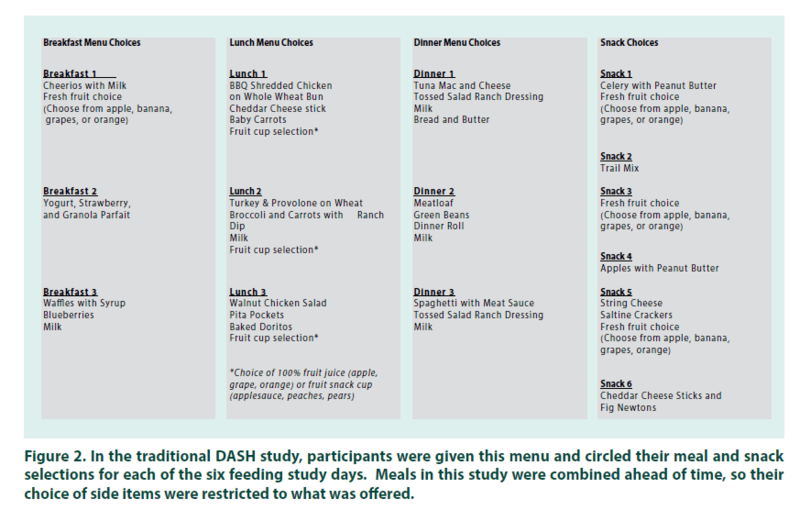 In our study, the DASH foods were provided to participants, and they were allowed to choose their preferences amongst a variety of meal and snack options. Also, the DASH-D was similar to their usual diet in energy, fat, and carbohydrate. All of these factors likely helped promote compliance and should be considered when designing a dietary pattern intervention for adolescents. A recent meta-analysis identified DASH as one of three dietary patterns that may be effective in preventing type 2 diabetes . The American Heart Association (AHA) recommends DASH as a healthy eating pattern to prevent cardiovascular disease (CVD) . The ADA recommends individuals with diabetes practice healthy meal planning and focus on overall eating patterns rather than individual macronutrients, yet it doesn’t specifically recommend the DASH diet. Given the AHA’s recommendation and the increased CVD risk for those with diabetes, it is prudent to consider DASH as a viable meal pattern for T1DM. Here, our research group suggests modifications to further adapt DASH to a T1DMfriendly diet, like DASH-D. The daily macronutrient and fiber distribution in DASH-D was consistent with established nutrition standards and was well tolerated. The DASH-D also achieved a moderate fat intake (~30% of energy) by reducing saturated fat and increasing fats from unsaturated sources, and minimized added sugar intake. Our traditional DASH feeding study was planned using ESHA Food Processor software, while the DASH-D was developed using the Nutrition Data System for Research (NDSR). Nutrient comparisons may have been affected due to differences in database values and completeness. For example, the version of ESHA used did not provide “added sugar” values, so it was not possible to compare this nutrient between the two diets. Comparing food group servings was even more problematic because the two nutrient programs define each food group differently, so the comparison provided here between traditional DASH and DASH-D should be interpreted with caution. The use of two databases in the traditional DASH study also precluded us from comparing usual intake (assessed with NDSR) to DASH feeding study intake (assessed with ESHA) in that trial. Another notable limitation is the use of two distinct participant groups in each study. If we had used the same participants across both studies, this would have strengthened our ability to draw conclusions about feasibility and acceptability between the two diets. Furthermore, the differences seen in weight and BMI when comparing the two groups are likely due to recruitment being sequential (i.e. assignment to groups was non-random), and the relatively small sample size in each. Both groups fell within normal weight and BMI percentiles, therefore we don’t expect that these differences affected results. Finally, our recruitment pool comprised adolescents being treated for T1DM at a diabetes center of a large children’s hospital; results may not be generalizable to other populations including adults, or those with T2DM. DASH is well-established as a healthy way to eat, with known benefits for heart health. The DASH eating pattern meets criteria recommended for those with diabetes, and DASH-friendly foods have been shown to be beneficial for controlling blood glucose. Our study has further demonstrated that the DASH diet can be modified to meet the needs of the adolescent T1DM population. DASH and DASH-D are prescriptive in nature, and this simple approach can be recommended by dietitians and taught to adolescents and others with T1DM. Since health behaviors of children and adolescents tend to follow them into adulthood, it is important establish good eating habits especially for those who will live with T1DM. The authors wish to acknowledge Medtronic (Minneapolis, MN) for supplying Continuous Glucose Monitor devices, which were used to collect blood glucose data throughout the study. We also acknowledge and thank Ms. Melody Hess, study coordinator, and all of the participants and families who volunteered their time and commitment to this research study. This work was supported by the National Center for Advancing Translational Sciences of the National Institutes of Health, under Award Number 5UL1TR001425-03. The content is solely the responsibility of the authors and does not necessarily represent the official views of the NIH. S Summer contributed to the study design, acquisition and analysis of the data and drafted the manuscript; S Couch and A Shah both contributed to the conception and design of the research and critically revised the manuscript; M McNeill contributed to the acquisition of the data and critically revised the manuscript; and A Peairs led the conception and design of the research, contributed to acquisition and analysis of data, and critically revised the manuscript. All authors reviewed and gave final approval of the manuscript, and all agree to be fully accountable for ensuring the integrity and accuracy of the work. Liese A, D'Agostino R, Hamman R et al. The burden of diabetes mellitus among US youth: prevalence estimates from the SEARCH for Diabetes in Youth Study. Pediatrics. 118 (4), 1510-1518 (2006). American Diabetes A. Foundations of care: education, nutrition, physical activity, smoking cessation, psychosocial care, and immunization. Diabetes. Care. 38 (S1), 20-30 (2015). Lattimer J, Haub M. Effects of dietary fiber and its components on metabolic health. Nutrients. 2 (12), 1266-1289 (2010). Mayer-Davis E, Nichols M, Liese A et al. Dietary intake among youth with diabetes: the SEARCH for Diabetes in Youth Study. J.Am.Diet.Assoc. 106 (5), 689-697 (2006). Appel L, Moore T, Obarzanek E et al. A clinical trial of the effects of dietary patterns on blood pressure. DASH Collaborative Research Group. N.Engl.J.Med. 336 (16), 1117-1124 (1997). Gunther A, Liese A, Bell R et al. Association between the dietary approaches to hypertension diet and hypertension in youth with diabetes mellitus. Hypertension. 53 (1), 6-12 (2009). Overby N, Margeirsdottir H, Brunborg C et al. The influence of dietary intake and meal pattern on blood glucose control in children and adolescents using intensive insulin treatment. Diabetologia. 50 (10),2044-2051 (2007). Peairs A, Summer S, Hess M et al. Effects of the dietary approaches to stop hypertension (DASH) diet on glucose variability in youth with Type 1 diabetes. Diabetes.Manag. 7 (5), 383-391 (2017). Moshfegh A, Rhodes D, Baer D et al. The US Department of Agriculture Automated Multiple-Pass Method reduces bias in the collection of energy intakes. Am.J.Clin.Nutr. 88(2), 324-332 (2008). Karanja N, Obarzanek E, Lin P et al. Descriptive characteristics of the dietary patterns used in the Dietary Approaches to Stop Hypertension Trial. DASH Collaborative Research Group. J.Am.Diet.Assoc. 99(8 ),S19-27(1999). Couch S, Saelens B, Levin L et al. The efficacy of a clinic-based behavioral nutrition intervention emphasizing a DASH-type diet for adolescents with elevated blood pressure. The Journal of pediatrics. 152 (4), 494-501(2008). Brehm B, Lattin B, Summer S et al. One-year comparison of a high-monounsaturated fat diet with a high-carbohydrate diet in type 2 diabetes. Diabetes.Care. 32 (2), 215-220 (2009). Shai I, Schwarzfuchs D, Henkin Y et al. Weight loss with a low-carbohydrate, Mediterranean, or low-fat diet. N.Engl.J.Med. 359 (3), 229-241(2008). Brunerova L, Smejkalova V, Potockova J, Andel M. A comparison of the influence of a high-fat diet enriched in monounsaturated fatty acids and conventional diet on weight loss and metabolic parameters in obese non-diabetic and Type 2 diabetic patients. Diabet.Med. 24 (5),533-540 (2007). Maffeis C, Morandi A, Ventura E et al. Diet, physical, and biochemical characteristics of children and adolescents with type 1 diabetes: relationship between dietary fat and glucose control. Pediatric.Diabetes. 13(2),137-146 (2012). Dahl W, Stewart M. Position of the Academy of Nutrition and Dietetics: Health Implications of Dietary Fiber. J.Acad.Nutr.Diet. 115 (11),1861-1870 (2015). US Department of Health and Human Services and US Department of Agriculture. 2015–2020 Dietary Guidelines for Americans. December 2015. Report No. McGill C, Fulgoni V, 3rd, Devareddy L. Ten-year trends in fiber and whole grain intakes and food sources for the United States population: National Health and Nutrition Examination Survey 2001-2010. Nutrients. 7(2), 1119-1130 (2015). Sacks F, Lichtenstein A, Wu JHY et al. Dietary Fats and Cardiovascular Disease: A Presidential Advisory From the American Heart Association. Circulation. 13 (3), e1-e23 (2017). Frost G, Brynes A, Dhillo WS et al.The effects of fiber enrichment of pasta and fat content on gastric emptying, GLP-1, glucose, and insulin responses to a meal. Eur.J.Clin.Nutr. 57 (2):293-298 (2003). Lodefalk M, Aman J, Bang P. Effects of fat supplementation on glycaemic response and gastric emptying in adolescents with Type 1 diabetes. Diabet.Med. 25 (9), 1030-1035 (2008). Neu A, Behret F, Braun R, Herrlich S, Liebrich F, Loesch-Binder M, et al. Higher glucose concentrations following protein- and fat-rich meals - the Tuebingen Grill Study: a pilot study in adolescents with type 1 diabetes. Pediatr Diabetes. 16 (8), 587-591(2015). Bell KJ, Smart CE, Steil GM, Brand-Miller JC, King B, Wolpert HA. Impact of fat, protein, and glycemic index on postprandial glucose control in type 1 diabetes: implications for intensive diabetes management in the continuous glucose monitoring era. Diabetes.Care. 38(6),1008-1015 (2015). Kwan M, Wong M, Wang H et al. Compliance with the Dietary Approaches to Stop Hypertension (DASH) diet: a systematic review. PloS.One. 8 (10), e78412 (2013). Saneei P, Hashemipour M, Kelishadi R et al. Effects of recommendations to follow the Dietary Approaches to Stop Hypertension (DASH) diet v. usual dietary advice on childhood metabolic syndrome: a randomised cross-over clinical trial. Br.J.Nutr. 110 (12) , 2250-2259 (2013). Jannasch F, Kroger J, Schulze M. Dietary Patterns and Type 2 Diabetes: A Systematic Literature Review and Meta-Analysis of Prospective Studies. J.Nutr. 147 (6), 1174-1182 (2017).